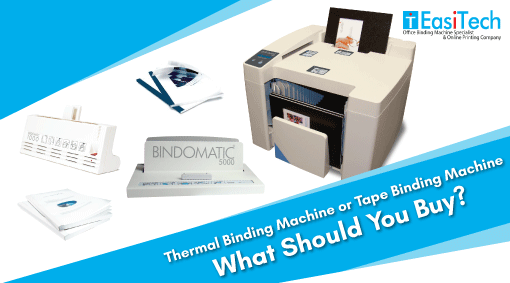 Home/Uncategorized/Thermal Binding Machine or Tape Binding Machine- What Should You Buy? Having so many choices is a boon and a hard blow, both. Well, we’d care to explain. On one hand, you can merrily explore myriad of options available to choose the best- you can revel in the feeling of finding the pearl from the ocean. On the flip side, you often get bewildered and don’t know whether to settle with choice A, choice B, Choice C or Choice XYZ. You see, this happens with all of us. No big deal. But it’s important to find a way to find the best option, and so, here we are today! The team of EasiTech has decided to help you choose a practically-good binding machine. This post will shed light on the two popular and most confusing choices of binders- read this post till the end and learn which one is better- thermal binding machine Malaysia and tape binding machine. Tape binding machines use a tape strip lined with some sort of heat-activated glue. Papers are placed in a pre-made cover which is then put into the binder. The machine melts the glue and binds the document. This binding is popular for preparing sleek reports and presentations that have less page count. Thermal binding machine Malaysia uses special covers that have glue on their spine already. Just like a toaster, the machine heats the glue and binds all papers that you’ve inserted. The best part is that paper ‘absorbs’ the adhesive, as result, papers set well and the document becomes more secure. Tape Binder or Thermal Binder? Now, lets’ face it- it’s sometimes (most of the times) difficult to figure out the difference between the finished output of thermal binding machine and tape binding machine. The end results look much alike- somewhat like twin brothers, if covers are identical too. But if you ask us which one is better, we would favor thermal binding machine Malaysia, any day. Why one has an upper hand over the other when the finished documents look identical to the highest degree? Well, here’s the answer to your why. With a tape binding machine, the finished document looks perfect initially. However, after a certain time span, the pages of the copy begins to loose, owing to the fact that the tape’s adhesive eventually dries and cracks. This problem primarily occurs when the document is used frequently. But the aforesaid issue won’t bug you in case of a thermal binding machine Malaysia. Thermal binding is the most permanent form of binding in which papers stay in place for the longest time span. So, if you have a thermal binder with you, you can expect to produce more durable copies that will serve you the best in long run. If you wish to buy thermal binding machines, check EasiTech’s selection here. We also offer other binding machinery and accessories- stumble upon our source and find all what you like.